A copy of a Eureka Journal from 1879 was recently found behind an antique mirror by a couple in Wisconsin. An 1879 edition of The Eureka Journal was used as cushioning inside this mirror and was recently discovered by Gary Frank of Evansville, Wis., as he refinished the antique. EUREKA — A reflection of the people and happenings in Eureka’s distant past has been discovered in an unlikely place: inside an old mirror in Wisconsin. 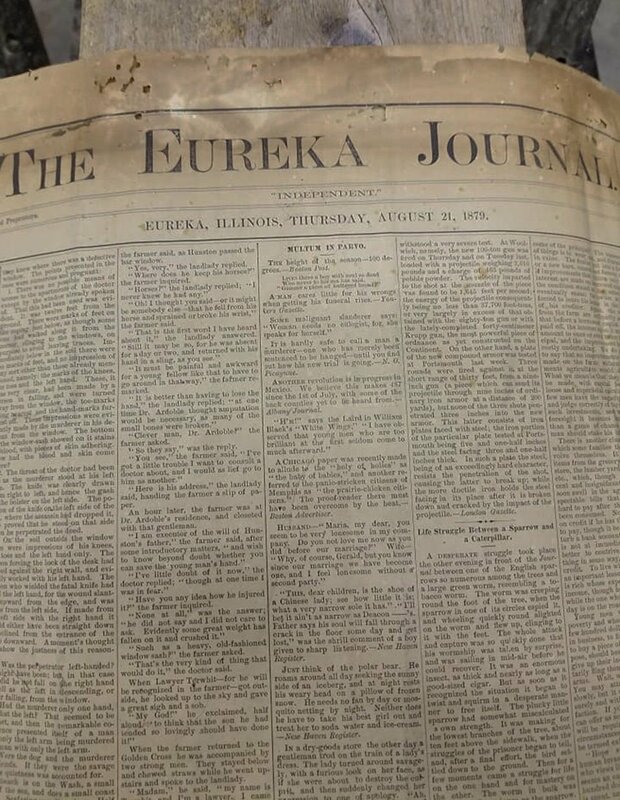 The newspaper was the Thursday, Aug. 21, 1879, edition of the Eureka Journal, founded in 1867. It was the forerunner of the Woodford County Journal. Ann Frank decided to share the find with the people in the newspaper’s town of origin. “I sought out the Eureka Facebook page because I thought it would be cool and possibly interesting to the folks in Eureka,” she said. Frank’s post spurred several suggestions from Facebook users recommending Eureka people and groups that might be interested in knowing more, including the Woodford County Journal. Although the couple are not professional antique collectors, Frank said they do own Eastlake-style furniture, which was popular from 1860 to 1890. The style is known for the philosophy that furniture and decor in people's homes should be made by hand or by machine workers who take personal pride in their work. It is sturdy, simple and incorporates more modest curves and designs than the highly decorative carving and ornamentation of other Victorian-era furnishings. Woodford County Journal editor Cheryl Wolfe said the oldest Eureka newspapers at the Journal office date to the 1890s, so a newspaper from the 1870s would be a very welcome addition.